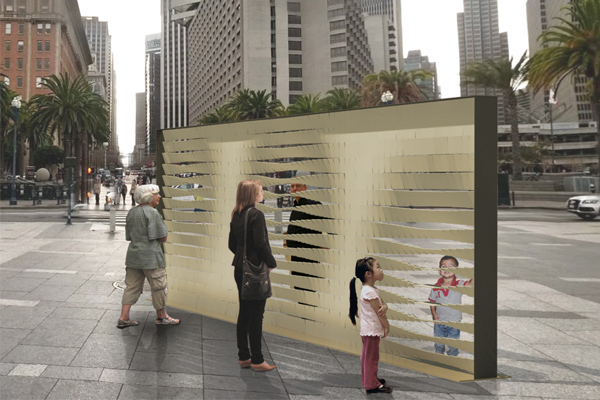 Several dozen major public art installations will burst onto display this weekend on San Francisco's main thoroughfare, part of a years-long effort to redesign Market Street in the midst of the city's tech-driven economic boom. A jury of artists and community members selected 52 proposed installations to be temporarily exhibited. "Public opinion -- as measured by interaction with the art, street surveys, census sensors and social media -- will determine which 10 or 12 artworks out of the 52 could return later as long-term public art," reports the San Francisco Chronicle. We've highlighted 13 of the most unique and fabulous installations that will be on display beginning Thursday. 1. Life through a toddler's eyes. What is it? "3 for Life is an oversized environment in which a typical adult will physically feel like they're in pre-school again." 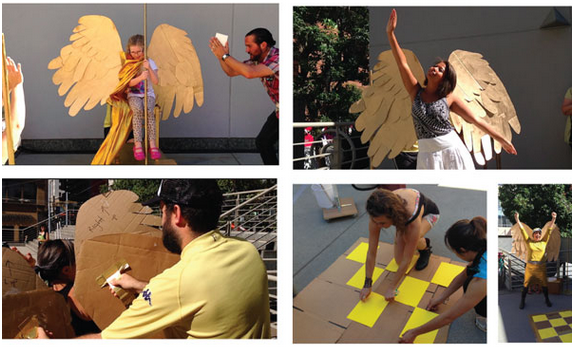 The installation hopes to "help adults (and even kids!) remember their compassion, confident and creative 3 year old self. 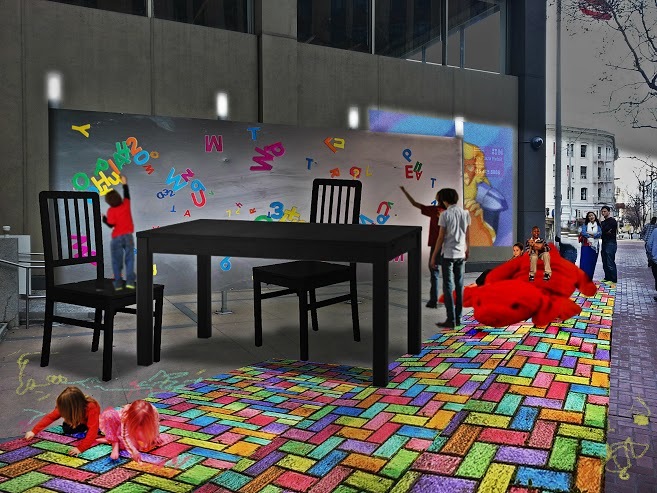 We will design and build to scale an oversized table, oversized chairs, oversized art easel, oversized drawing pad, oversized crayons, oversized hopscotch, etc, in which a 'grown up' feels as if they’re just a kid -- small, vulnerable, in need of help, and the overall consistent feeling of being in awe!" 2. Art meets disaster preparedness. What is it? The Neighborhood Preparedness Unit is "a novel public disaster preparedness kit designed to build resiliency at the community level," organizers say. The safety features work even "when power, water, and communication are lost," and in non-disaster times, the installation "promotes an infrastructural awareness, while maps and a graphic interface educate about natural hazards such as floods and earthquakes. This unit is also designed to have a double function for performances, storytelling, and human play." 3. 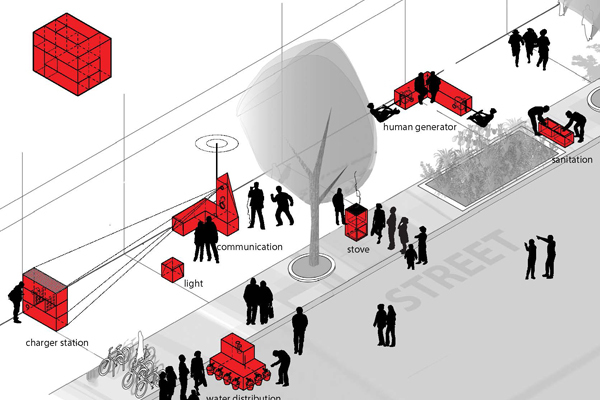 A pop-up public library. What is it? The San Francisco Public Library is behind this installation, called Bookmark. 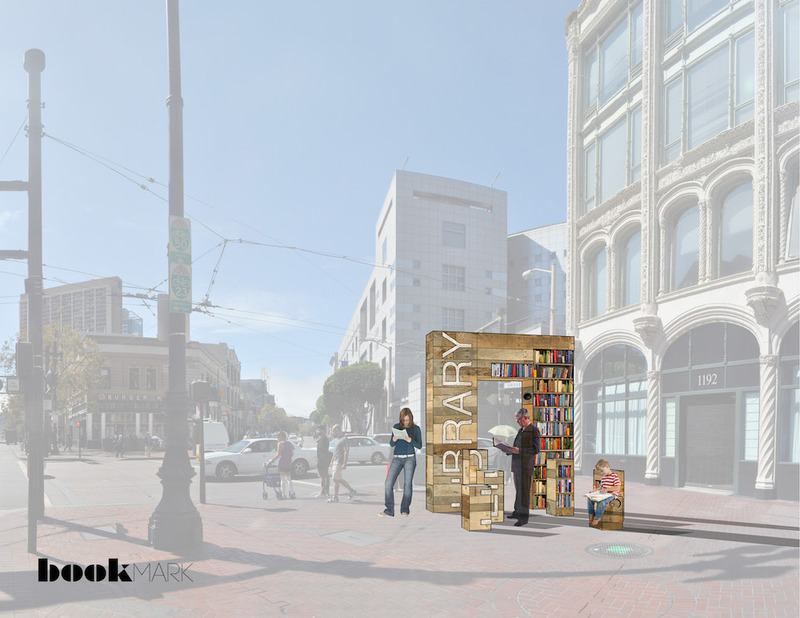 "The gateway, built out of SF residents' favorite books, will orient passers-by toward the library. As people walk through the gateway, they will hear an audiobook from the library's collection, and a sign will encourage them to hear the rest by borrowing an audiobook. 'Did you know? '-style information about the library will be displayed along with a selection of books for all ages that are free for the taking." 4. A two-story pile of life-size Jenga blocks. What is it? 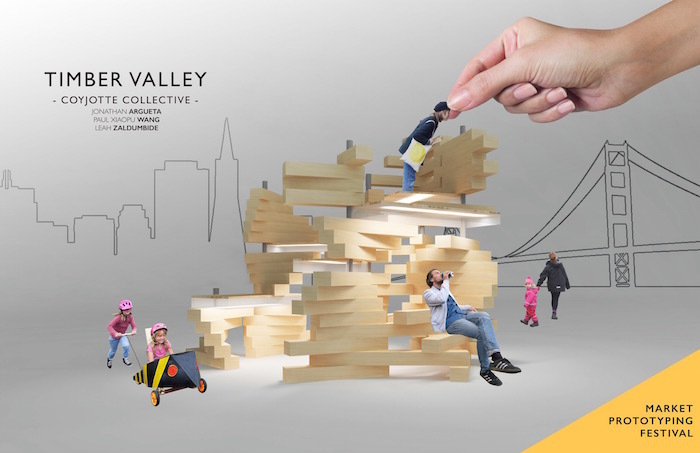 "Timber Valley is an installation of interlocking, stacked wooden blocks and platforms that inspires people to linger, interact and perform. The public is able to interact with, rearrange and rotate the blocks when they are unlocked at specific intervals during the duration of the event." 5. Flowers you control with your mind. What is it? 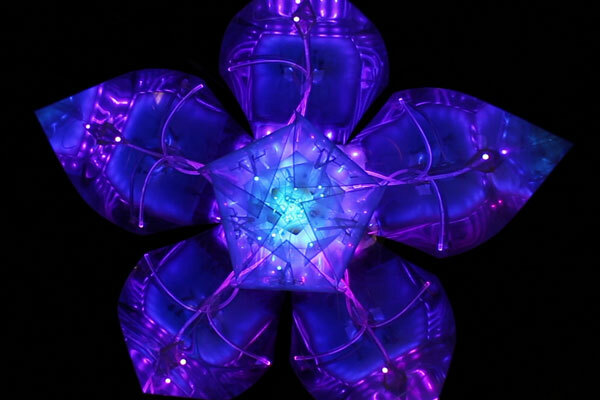 A set of interactive, solar-powered digital flowers that respond to brain activity, created by interactive tech artist Ashley Newton. "NeuroFlowers is an interactive biofeedback-based art piece. Using EEG to read electrical currents from the surface of the head, we can determine different mental states, which then guide the behavior of illumino-kinetic magic flowers. With NeuroFlowers, the internal becomes external. The mind becomes tangible, shareable. Calming or focusing your thoughts changes the blossoming state and color of the flowers." 6. A shape-shifting interactive wall. What is it? MeetWall is a "stunning interactive wall that comes to life and becomes transparent when people approach it." The installation is "composed of an array of lightweight tiles that rotate about their center in response to sensor input. MeetWall’s Kinect sensors monitor proximity and location of those within range of the wall. As one gets closer to the wall, the tiles are activated, and rotate to 45 degrees to allow some transparency. When two people are aligned at either side of the wall, the panels in the zone of said people rotate to 90 degrees, allowing full visual connection. This sudden and unexpected face to face with a stranger provides a unique experience that strips away the anonymity of the urban street. During phases where no individual is within immediate range, the wall flutters and flirts, inviting people to investigate." What is it? The installation "It's News to Me" is a large-scale, audio-enabled replica of San Francisco Chronicle columnist Herb Caen's typewriter, with keys for seats. Caen's columns, which he dubbed "a continuous love letter to San Francisco," appeared in the city's main paper for nearly 60 years, and he was awarded a special Pulitzer Prize a year before he died in 1997. 8. A revolving doorway that leads to inner peace. What is it? 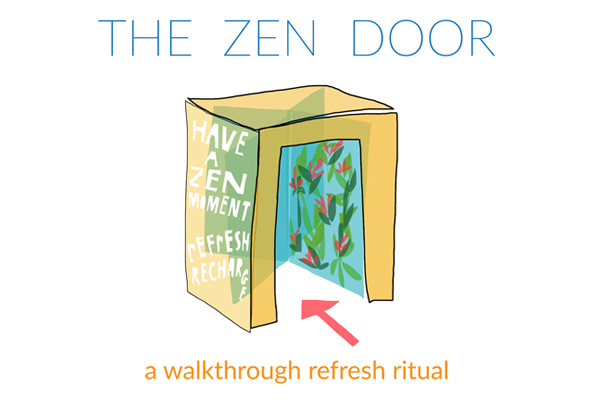 The Zen Door is "a revolving door inside of a 12 ft. cube that creates a natural and peaceful experience for the people who walk through the door -- offering a quick recharge and refresh. When you enter the revolving door, you have your own private space that is covered in plants and flowers, has gentle lighting, with a fresh mist circulating, and relaxing music playing. The air is fresh and full of oxygen, the music and lights are relaxing, and the walkthrough is a delightful break from the Market Street bustle." 9. Collaborative music driven by facial expressions. What is it? The Sound of Emotion installation is "designed to encourage collaborative music creation." It will "incorporate four iPads, configured in a rectangular array. For the selected musical genre, each device will represent a single unique instrument (e.g. World Beat: iPad 1: didgeridoo, iPad 2: bata drum, iPad 3: hand-held percussion, iPad 4: bells). The instruments will be 'played' through each iPad’s proprietary emotion detection software. 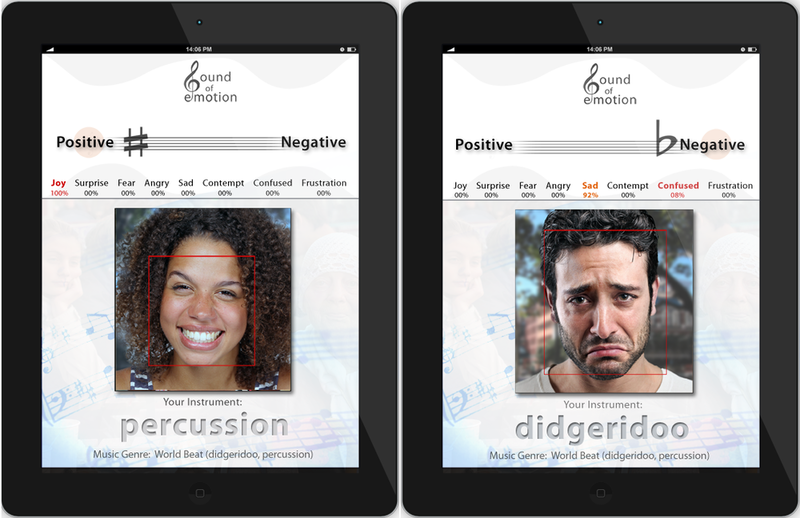 The software recognizes up to seven unique facial expressions - when an individual walks up to the device, their instrument begins to play. Each additional person represents a new instrument with the opportunity to shape the resulting music collectively through their expression." 10. Funky public ping pong. What is it? Ping Pong is "the world's second most popular sport behind soccer," organizers say, and moving the game "from the privacy of basements, offices and recreation centers into the street can enliven our public places." 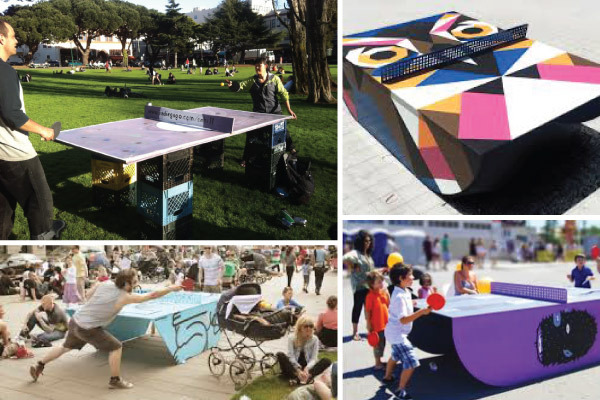 The "Public Ping Pong Project" will offer "canvases for local artists as well as provide a fun and interactive setting for all residents." 11. An urban butterfly habitat. What is it? Organizers of Habit(At) say San Francisco is the perfect home for the Western Tiger Swallowtail Butterfly -- "the London Plane Trees, tall buildings, warm climate, and dappled sunlight make it ideal" -- but that most of the caterpillars eventually fall from branches onto the sidewalks and don't survive. 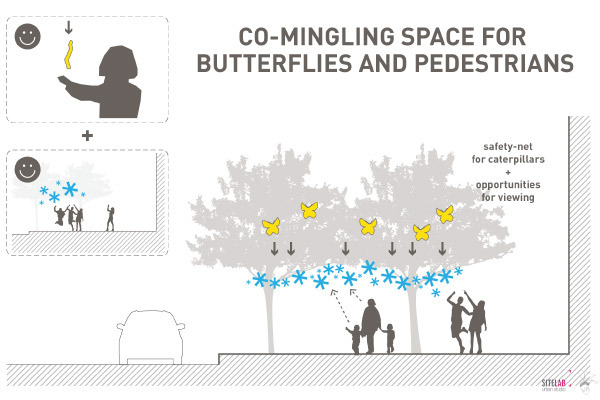 Their idea is to equip several trees with lighted mesh to catch and protect the caterpillars, "uniting butterfly ecology with human observation and discovery." 12. A "gym" to strengthen your confidence. What is it? The "Daily Boost" installation is inspired by a TED talk by Amy Cuddy about the physiological benefits of stress-busting body language and Power Poses (think "Wonder Woman"). "The gym will contain 4-6 pieces of furniture, with attached hand-held props. Each piece of equipment supports a different positive emotional state such as 'powerful,' 'meditative,' or 'heroic.'" The organizers write, "Through history, you can find many examples of power poses in civic statues, religious furnishings, and royal accessories. What’s exciting is that this rich history offers ideas for a new genre of 'outdoor gym equipment.' Why not 'be' the victorious leader on the Pedestal? Why not take a sunshine break and sit on a throne? Why not de-stress on a meditation bench?" 13. 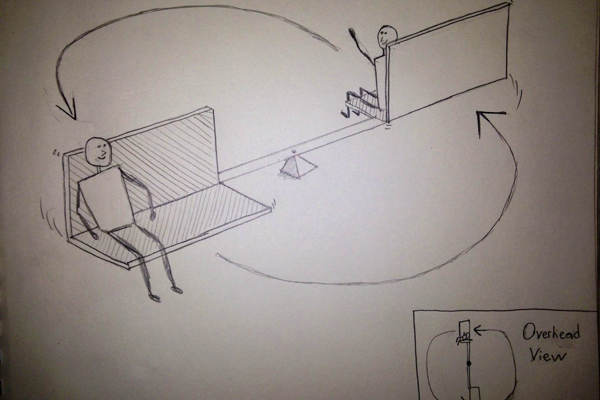 A bench meets merry-go-round. What is it? 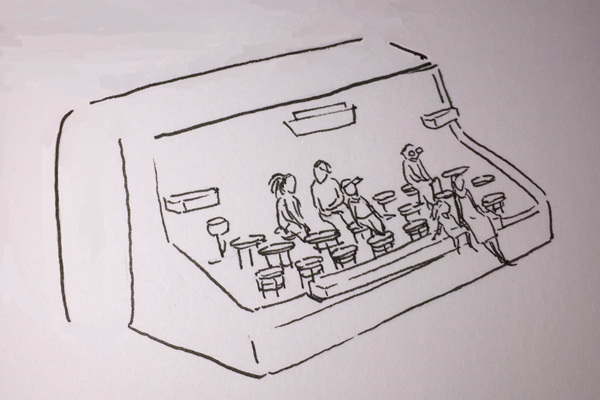 The Bench-Go-Round is "interactive public seating" that "encourages connection and play between pedestrians" and "promotes a spirit of cooperation and collaboration amongst groups that may not normally interact... One can use the bench alone for seating. But when someone sits on the opposite bench, a surprising and delightful physical relationship between the two people is formed."